Rain Chain. 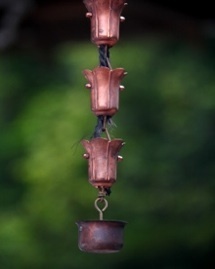 Enchanting chains for your rain water barrels. Add sound and charm to your landscape with unique rainwater chains. A Rain Chain adds ambience to rain water barrels. Made of copper, brass or aluminum the chains guide rainwater into your storage barrels adding beauty and sound to rainwater collection systems. Don't hide your rain water barrels or rooftop runoff, draw attention to them with a rain chain. A rain chain adds appeal to your landscape whether it guides rainwater to a drain in the ground a planting bed or a rustic wooden rainwater barrel. Downspouts can be... well, ugly, while chains glittering with rainfall or enrobed in ice can be the main attraction. Rainwater chains create an audible and serene open water feature while at the same time serving an important function. Directing rooftop rainwater to collection tanks or to the ground decreases water erosion, runoff and damage to root systems. Chains can be specially designed for the purpose - and they're very intricate in some cases - or plain heavy links can add an old world feeling to your yard. Japanese gardeners have been using rain chains for thousands of years to bring tranquility and order to garden spaces. And no wonder, what could be more tranquil than a mini waterfall every time it rains? The chain is simply fixed to the hole in your gutter (where the downspout usually goes) and allowed to fall to the rainbarrel or garden area. The chain can be secured to the ground to direct the rainwater to a specific place or allowed to fall into a rain water barrel. Usually about 8 feet in length, rainwater chains can be custom ordered to fit your specifics or altered at home to fit your situation. There's even a short video below with instructions on how to make your own. In most cases there is no need to remove the rainchain in winter months. Ice and hoar frost covered chains are a delightful addition to a winter yardscape. Here's a video with instructions on how to make your own rainwater chain.